Xela Pages - Quetzaltenango "Xela" Guatemala Travel Guide. Spanish Schools, Hotels, Restaurants, Volunteer Opportunities, Tours, Treks, Blogs...etc. Visit the webpage www.sancarlossija.com for more information. If you would like to experience a relaxing thermal bath in the midst of a beautiful forest setting, go to Agua Caliente, so-named for the natural hot water spring that surfaces there. You can enjoy the spring in a sparkling pool or a private bath in the new bath house. This clean, remote area is perfect way to escape from a hectic day of traveling and enjoy a rejuvenating fresh water bath. 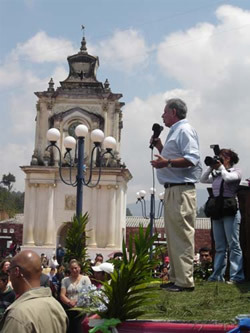 You can find Agua Caliente off of the Interamerican Highway on the route to Huehuetenango, kilometer 230. Take a left and follow the dirt road for 15 minutes. On the way enjoy the landscape which makes this area a popular destination for locals. Every Sunday is market day in the main plaza of San Carlos Sija, beginning at 6 in the morning until 2 in the afternoon. In the market you can find fruit, vegetables, furniture, and the famous Sija cheese. People come from the surrounding area to purchase goods and enjoy the bustling environment. The famous Sija tower stands in the center of San Carlos Sija, a cultural monument constructed in 1902. The tower was reconstructed in 1913 after an earthquake. It now overlooks a modern style park where you can relax, chat with locals, buy snacks and play basketball. 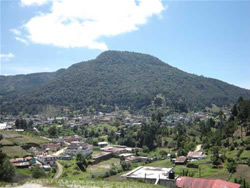 Great for a one day hike to see nature and views of the surrounding areas, these mountains that border the town of San Carlos Sija are famous for their wildlife, shape and size. Many species of plants and animals can be found here, and the walk to the top is an easy 40 minute hike. Both mountains are favorite local hangouts and frequent destinations of holiday expeditions. Once in the town’s center climb the road with the mormon church on the right and when you reach the Church of God (Iglesia de Dios) at the top, turn left and follow the trail. The biggest and most widely celebrated fair in San Carlos Sija runs from the 7th to 15th of December, in honor of the Virgen de Concepción. During the fair there are traditional dances with colorful costumes, an Argentinian Horse race, basketball and soccer competitions, fair rides and games, and many concerts with various types of music. At night in the Municipal Hall there are dances with various artists, competitions, and theme nights in which everyone dresses as cowboys or in formal wear.